RBTH presents a selection of views from leading Russian media on international events, featuring reports on energy protests in Armenia and the participation of the OSCE's new special representative Martin Sajdik in talks on Ukraine, as well as analysis of the growing rivalry between the U.S. and China. The centrist Nezavisimaya Gazeta newspaper reports that demonstrations organized by the civil movement “No to robbery!” have renewed in the Armenian capital Yerevan, where residents are indignant about an almost 100-percent increase in the cost of electricity. Grigoryan says that this also affects the Armenian company Electric Networks of Armenia (ENA), which is essentially Russian: “Rumors of a conflict between ENA and the Armenian government have been circulating for a while,” he said. According to Grigoryan, the company is now compensating its misuse of funds with an increase in prices, which naturally provoked the people's anger. Grigoryan believes that this kind of interaction between the Armenian government and the Russian company discredits the integration process: "People in Armenia had expected that life would become easier after the country entered the Eurasian Economic Union. The almost 100-percent increase of electric energy prices is a cold shower for the country," he said. Grigoryan does not rule out a continuation of the demonstrations. When Nezavisimaya Gazeta asked him if there are any parallels between what is happening in Yerevan and the Maidan protests in Kiev, he replied that there is a difference. 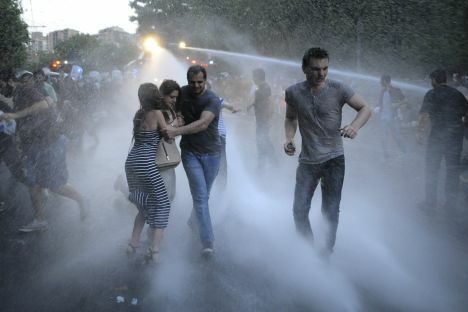 "In Ukraine the political opposition sided with the demonstrators, while the protesters in Yerevan are civil activists. But if the opposition enters the protest, its dimension will increase." The business daily Kommersant writes that the realization of the Minsk peace agreements recommenced on June 23 during a session of the trilateral contact group on Ukraine when the OSCE's new Special Representative in Ukraine Martin Sajdik joined the talks. "The dynamic of the talks within the contact group will tell us about the viability of the Minsk agreement, the only hope of regulating the conflict," said Sergei Utkin, deputy director of strategic evaluation at the RAS Center of Situation Analysis. According to Utkin, the OSCE representative is "a mediator who can influence the participants to be more tolerant of each other and who can propose the right formulations, while making sure that the responsibility for achieving a compromise remains on the shoulders of Kiev, Moscow, Donetsk and Lugansk." Moreover, a new round of talks between the foreign ministers of Ukraine, Russia, Germany and France has taken place in Paris. Despite the active dialogue, the situation in the Donbass region of eastern Ukraine is still on the verge of re-exploding into a full-scale conflict. "The demarcation line has turned into a frontline, which is not moving deeper into Ukraine only thanks to Ukrainian military efforts, and not the Minsk process," said Ukrainian political analyst Viktor Ukolov. He added that "if an agreement within the current formats is not reached, the process will have to begin anew with the more active participation of the U.S."
The business magazine Expert reports that the annual meeting between Chinese and American officials has begun in Washington, D.C. The publication writes that the United States needs a new policy on China, which is trying to squeeze it out of Asia. The U.S. is not only alarmed by Beijing's growing ambitions, either in the South China Sea or by the banks it is opening worldwide, but is also increasingly frightened by the fact that it does not know how to fight China's strengthening authority and influence in the region. Many American politicians see a competitor in China, which, besides a fast-developing economy, also has substantial military power. Officials in Washington are now feverishly looking for a Plan B, a sort of reset to American-Chinese relations. The range of proposals is vast: from a drastic increase in military expenditure to an agreement with Beijing that would practically signify the division of the world. "It is already clear that the fight for leadership between the U.S. and China promises to be intense," writes Expert.